The rickshaw paddler? What’s his cost? That ten rupees note he earns for making one trip towards Community center from my hostel (Some half a kilometer distance)? They rush up in their tethered clothes and sun beaten skins (as if they haven’t taken a bath in ages) whenever they see us coming out of our hostel. They lack pure sanity, how can they act so insane for the few bucks that which would mean so much toiling and so much sweats? Even when we wait alongside the road for auto rickshaw, they paddle in front us trying their luck lest we change a plan to sit on their little seat and travel through the large crowded road. Their most trips includes towards the bus stand or the community center from our hostel. They always gather themselves around our hostel gates much to the abhorrence of guards and the vehicles in and around the hostel. It is believed that there are more than 10 lac rickshaw pullers in entire region of Delhi. It was Saturday night. As I stay in hostel, the mess remains closed in Saturdays. Though I don’t eat in the mess most of the times, it was kind of boring and same old food which I was feeding on in the hostel though I was on varieties from canteen and Nescafe. I and my friends decided to visit a community center. We cleaned up ourselves and headed for our dinner. I was with one of the friends on the rickshaw. We were aboard on one of the rickshaws. It was getting darker. The dusk has already given its way to the night. The vehicles honked with headlights. People on the road were busy. I could see him properly except for the shawl that he was covered with and the piece of scarf which he covered over his head with. The paddling with his torn out slippers, and the dark brown muscles were quite apparent. I was observing closely in the darkness. He breathed hard, but was quite easy on his driving. “Kanhaan se hai abb, Bhaiya?” I asked him. “Bihar”, he didn’t even look as he answered. I approved with a thought that he was busy and attentive. The road had so many turns and cuts. It was full with vehicles. Delhi claims to have more vehicles compared to the number of vehicles combined in Chennai, Mumbai and Bangalore. “Toh, abb ka ghar main kaun kaun rehai ta hain? They basically survived on his rickshaw income which collected around 200 to 300 a day or less when fortunes are less on the lanes. The rickshaw apparently didn’t belong to him. It was on rental. 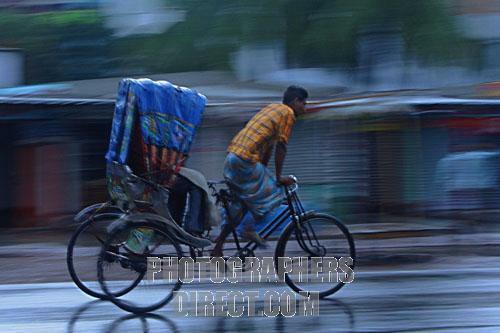 There are as many rickshaw pullers in urban Delhi who migrated from rural states of India. Just like everyone as in urban cities, they came in search of a better lives and a good income. The traffic got heavy. There was a jam in the red light junction. The vehicles fought for their way. They weren’t less insane as well. No one followed the traffics properly except when policeman stood somewhere nearer or on the point. He shoved us through the maze of vehicles. It made him easy with rickshaw. I used to be terrified in earlier days in Delhi. Now I am used to heavy traffics and constant jams. My friend and I were getting little anxious about the dinner with friends who were waiting for us. So we urged him to paddle faster. He didn’t dismay us. And he paddled harder. We got off on the pedestrian platform. I was asking him if he has some changes when it sent the chilly thrill through my vein. I became scared with what I saw. He was without one hand! And the one-hand-rickshaw puller paddled us through such heavy traffic and I was on it? I was shocked and terrified. My dad won’t allow me to travel so often in vehicles back at home and here I just rode on a rickshaw paddled by a man with no one hand. That was ridiculously terrifying! I was afraid, and the thought that such a despairing situation of such a less-fortunate man didn’t give up the burden of life made me confused but scared. What could have happened had we met with an accident? Who in the world allowed him the rickshaw? Even when auto rickshaw drivers charge us lofty money, we retaliate with questions like what in the world a beggar needs to demand, and here I was shocked and hurt but can’t do anything to him. Would I care less about his misfortune and brag him about his casualness in taking a rickshaw or would I care less about his carelessness in being a rickshaw driver, thus jeopardizing other’s life, and sympathize his misfortune? A person of my character who gets easily sensitive on such pathetic issues of life, I didn’t know how to balance my anger and my sympathy to him. That night I had the most tasteless dinner ever. I was engrossed in such brutality and accident of life.